On January 10, 2015, unusually bright and colourful iridescent clouds were observed along the Alps between Switzerland and Hungary. To display the huge area in which the observations were made, Kevin Förster plotted all known observations into the satellite image taken at 12 noon that day. 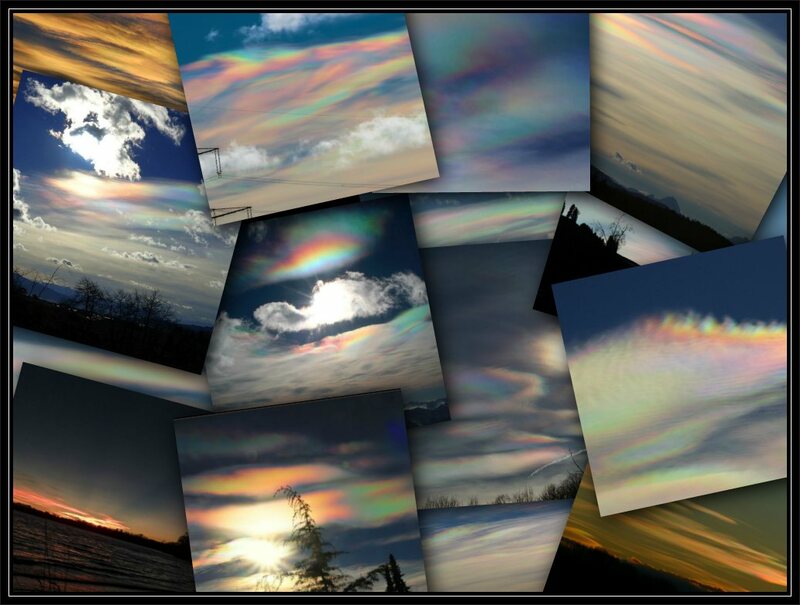 The cloud iridescence was observed in 7 countries (Switzerland, Liechtenstein, Austria, Germany, Italy (Southern Tyrol), Slowakia and Hungary). The westernmost observation point is Fribourg in Switzerland, the easternmost one is Tápiószolos in Hungary. This means that the iridescent clouds were observed along a distance of 965 kilometres and in an area measuring about 122,500 square kilometres, which ist about a third of the area of Germany. There is no case of a similarly distinctive iridence known so far. Many observers reported iridescence stretching up to large angles from the sun and a great similarity to nacreous clouds. These form above northern latitudes at very low stratospheric temperatures beneath -80°C in the ozone layer. The iridescent clouds were visible until 20 minutes after sunset, followed after an intense afterglow on clouds which still received sunlight up to 45 minutes after sunset. At some places eye-catching crepuscular rays were also observed. The 30 hPa-Chart, however, shows that it was much too warm for polar stratospheric clouds to form. Nevertheless the cloud layer must have formed at higher altitudes than normal. One observer reportet that all airplanes flew beneath the clouds, and also many pictures show contrails below the cloud layer. So the clouds probably formed at more than 12,000 metres above ground. 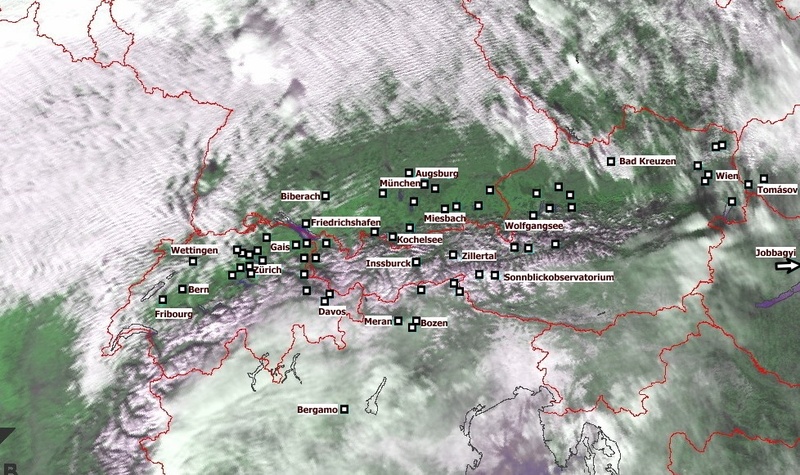 Discussions about the weather situation in our forum and measurements by the Austrian weather service (Central Institution for Meteorology and Geodynamics ZAMG) showed several peculiarities of the situation: Strong foehn winds caused gravity waves which peaking at about 14,000 metres above ground. 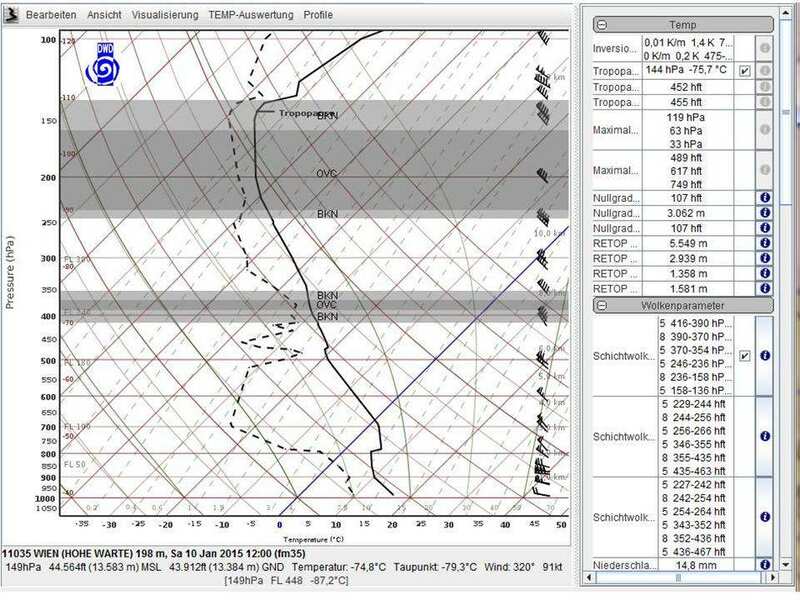 This was the level of the tropopause, which was unusually high for these latitudes that day. And it also was unusually cold, as a radiosonde launched in Vienna measured a temperature of -75.7°C. The highest of the multilayered foehn clouds formed along the tropopause. Due to their high altitude, their droplets were of the optimal size to cause iridescence. Unfortunately, it can not be clarified if there also formed small ice crystals like in nacreous clouds because strong vertical movements may impede the freezing of the droplets. Thanks to all who put their pictures at our disposal and helped us with data, special knowledge and hints to clarify the reason for this phenomenon. The discussion can be found, together with a lot of photographs and some time lapse videos in the forum of the Arbeitskreis Meteore e.V. Posted on January 14, 2015, in coronae and iridescence, observations and tagged colours, diffraction, iridescence. Bookmark the permalink. 2 Comments.